How Can You Tell if a Baby Painted Turtle Is a Girl or a Boy? It's hard to determine the gender of a baby painted turtle (Chrysemys picta). Baby painted turtles, regardless of gender, look the same. 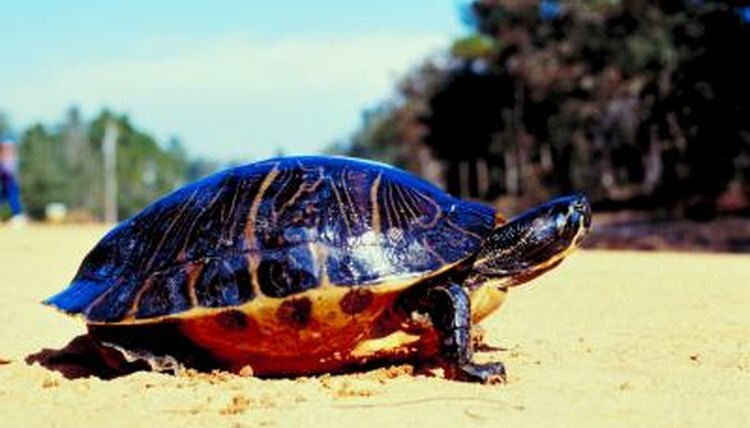 The visible characteristics do not form until the turtles mature to at least 4 to 6 inches long. Once baby painted turtles have matured, telling the difference between male and female painted turtles becomes simple. When in the egg, the nest or incubator temperature can determine the gender of the baby turtle. Cooler temperatures will lead to a higher ratio of males; higher temperatures lead to more females in the clutch. In the wild, a typical clutch of eggs will not be all male or all female, as the temperature in the nest may vary depending on the depth of one egg compared with that of another. For captive breeding, if you set an incubator around 87 degrees Fahrenheit, the clutch will be mostly female. If you set the temperature as low as 77 degrees Fahrenheit, your hatchlings will be mostly male. Male painted turtles have longer front claws than females. Male painted turtles have long tails that are wide at the base; female painted turtles have thin, short tails. The cloacal opening on the male is away from the body and further down the tail; it is close to the body on a female. What Is the Gestation Period of a Snapping Turtle? What Determines the Gender of an Alligator? How Do Crocodiles Give Birth? What Do the Eggs of a Yellow Bellied Slider Turtle Look Like? What Does a Green Anole Egg Look Like?